Did you say Pickled Mustard Seed? Why, yes I did! I’m talking about yellow mustard seeds that have been, well, pickled….and the result is delicious! And easy! Because I can’t be bothered with difficult. I got the recipe from David Chang’s Momofuku cook book – David Chang, for those of you who are not native New Yorkers or frequent visitors, is a chef extraordinaire, turning Korean food upside down and inside out and giving to us a sensory over load of tastes and flavours. You really need to hunt him down on your next visit to the Big Apple, and try to eat in one or all of his restaurants. A very inspiring and passionate man. 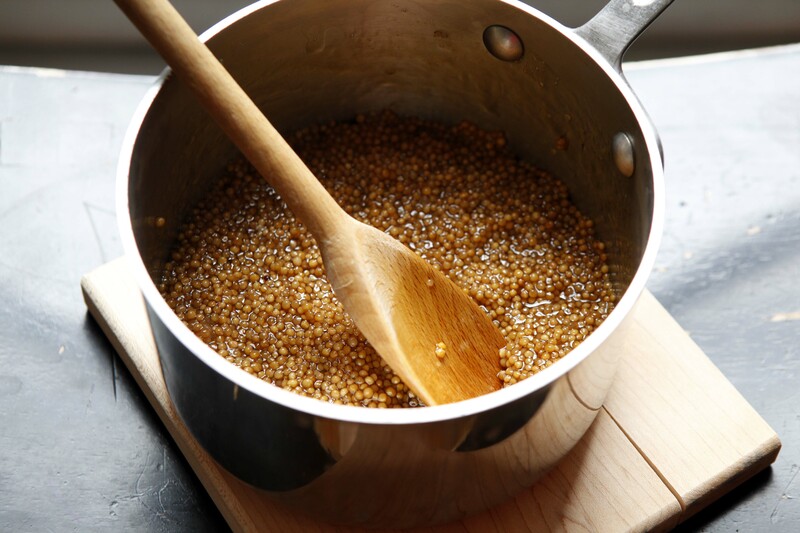 Combine the mustard seeds, water, vinegar, sugar, and salt in a small heavy saucepan and bring to a gentle simmer over low heat. Cook, stirring often, until the mustard seeds are plump and tender, about 45 minutes. If they look like they’re beginning to dry out, add water as needed to keep them barely submerged. Cool and refrigerate in a covered container. It will keep for months. I halved the recipe this time round – and it worked perfectly well. Then what I did was pair the pickled mustard seed with a wonderful piece of sirloin (you can use any cut of meat you prefer), about half a pound / 230 grams. Grilled it to medium rare, which is how I like it, but here’s the trick. 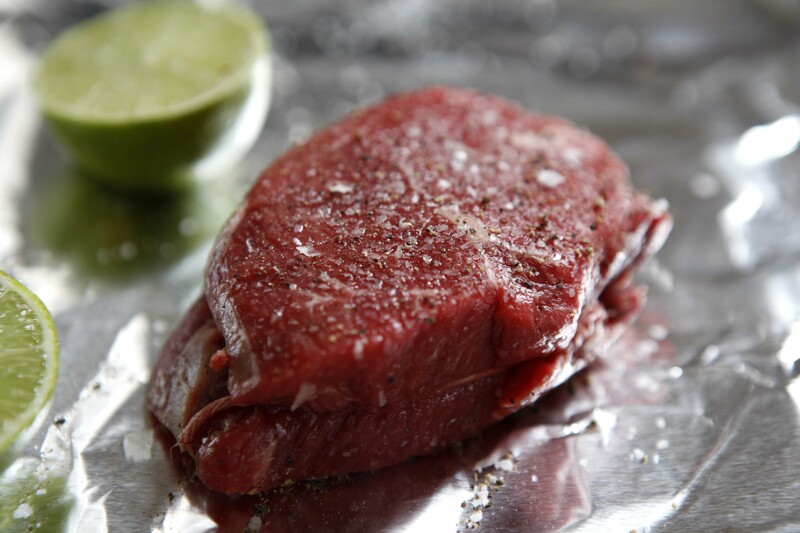 Before you take the steak out of the oven, or off the grill, do yourself this big favour. Take a wooden chopping board, and onto that board place a small clove of garlic, minced. Some grated lemon or lime rind, course sea salt, cracked black pepper, a squeeze of the lemon or lime and a drizzle of olive oil (not too much because you’re pouring this directly on to the board). Mix it all up so the flavours meld together. Then spread it out to about the size of the steak. 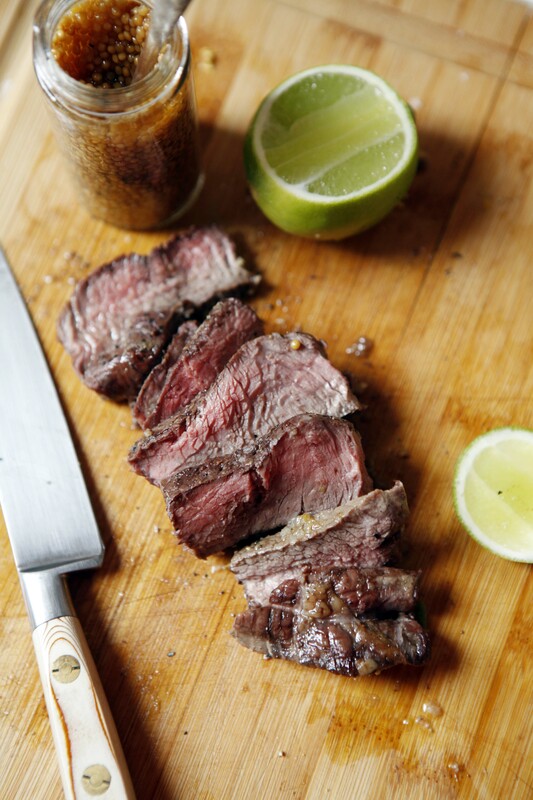 Once the steak comes out the oven, place it straight on the board, on top of your mixture. What happens is as the steak is resting, it absorbs some of the flavours of the mixture, giving it a lovely lemon-y, slightly garlicky finish. So good! 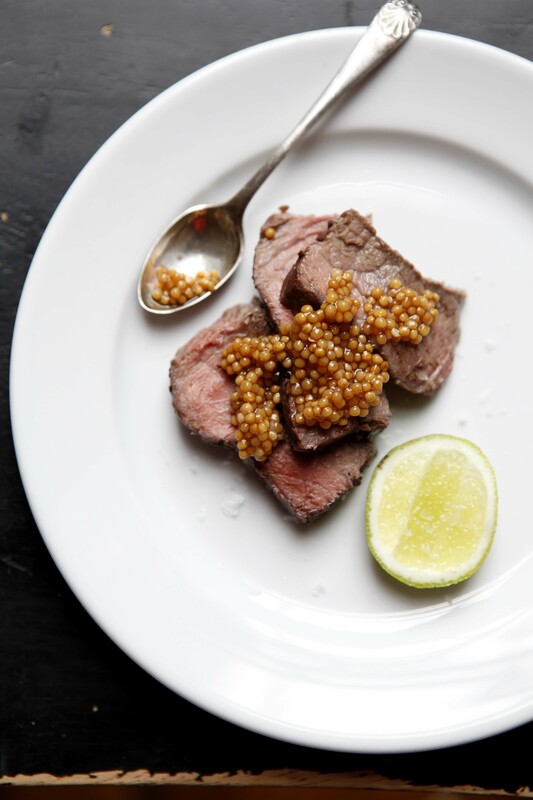 Slice it thinly, place on your plate, and spoon the pickled mustard seeds over the steak. You could also grill a bigger piece, slice thinly and serve as an hors d’oeuvre with a little spoonful of the mustard seeds and perhas a tiny sprig of cilantro/coriander. And as you take a bite, feel the mustard seeds pop in your mouth. Archive 4th of July Pavlova When in New York, Do as the Romans Do – Braised Baby Artichokes Sweet Paul Gravlax – Home made Salmon Gravlax The Power of Simple – Chocolate Cupcakes Summer Calamari Salad Father’s Day Bagel – Chris’s Vongole Memorial Day Weekend: BBQ With a View Azad, Poorna, Anav and us – Beetroot Salad, Curried Cauliflower Drinks for Two – Gin and Tonic anyone?